Join the discussion on our forums! 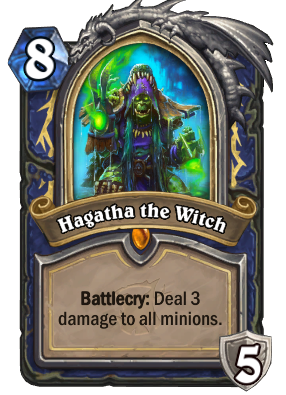 Come discuss Hagatha the Witch over in our dedicated Hagatha the Witch discussion topic. Because not all HS players play Overwatch. The infinite value with Shudderwock! Good with Control Decks too. Was hoping she'd actually rhyme. One of the only DK's without infinite value, or near infinite value. I think that makes this DK a pretty balanced one. Generating totems becomes prety uselss late game and is used to try to use all the mana you can, but with the passive hero power, you will likely find better use for those two floating mana crystals. At the same time, this DK is not a win condition, like Jaina or Gul'dan. You'll find it fun in some derivatives of Even Shaman or a Token Shaman deck. She's not an outright win hero, more a win-more hero. I'd still take the bird lady. Echo cards and cheap minion generators like Fire Fly work well with the hero power. 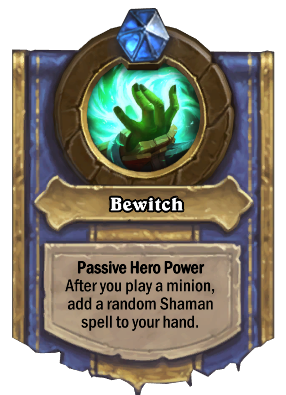 However, the random Shaman cards you receive can be either hit or miss (Blazing Invocation vs Ice Fishing). When you take Overload into account, you have to make sure that your hand doesn't fill up with expensive spells that you can't play (Lesser Sapphire Spellstone). This card rocks in Wild. Not from my exp with Hagatha the Witch, because she has helped me recover, and retake some games so far. I like the card more than I thought I would. What Rank are you playing her? Yeah, Rank 10 in Wild, with Murlocs. That proves nothing other than Murloc Shaman is strong in Wild. It does not prove Hagatha the Witch is a good card, or that it works well in Standard. I've been playtesting her at legend (first time ever!) in decks like Elemental, Even, Tempo Corpsetaker, etc. I can verify that she's really good (albeit a bit expensive). She provides an extra board clear against aggro (plus a little life gain) and enough value to beat those slow attrition decks, all in one card. Definitely worth the craft for me!